Medtronic plc manufactures and sells device-based medical therapies worldwide. Over the past week, dividend champion Medtronic raised its quarterly dividend by 13.10% to 43 cents/share. This increase marked the 39th consecutive year of an increase in the dividend payment for Medtronic. Medtronic`s dividend per share has nearly quadrupled over the past decade and has grown at an 18 percent compounded annual growth rate over the past 39 years. The company has managed to boost dividends by 14.30%/year over the past decade. "Today`s double-digit increase in our dividend reflects the confidence the board and our management team has in Medtronic`s ability to deliver consistent and sustainable growth, as well as to generate significant and increasingly accessible free cash flow. We are deploying considerable amounts of capital strategically, consistently, and with discipline to provide attractive returns for our shareholders. This includes our focus on delivering dependable, long-term growth in our dividend." This is what successful dividend growth investing is all about. You have a company that has a winning formula, which allows it to generate higher earnings over time. This winning formula is what others refer to as a moat, or a competitive advantage. This moat could be strong history of innovation, a dominant market position, a unique product or service, regulated monopoly, substantial switching cost, or a network effect. The company generates so much in extra cash, that it has decided to share this growing pile with shareholders. This is how quality companies manage to build a track record of 39 consecutive dividend increases in a row. Only companies that have some unique competitive advantages in their field manage to achieve such a track record. In Medtronic's case, the company is a leader in many fields in the competitive world of medical devices. Despite showering shareholders with more cash every single year for almost four decades in a row, the company is still able to grow. Smart management teams achieve that only by investing in projects that provide high returns on investment. The dividend provides management with a way to focus their limited resources only on the most profitable projects, in order to grow the business. This disciplined approach to growing the business ends up generating growth in earnings per share and torrents of free cash flow to share with stockholders. As we have discussed before, there is value to dividend growth. Let’s say that you owed 100 shares of the company. The value of the shares as of Friday would have been $8,326. You would have expected to generate $152 in annual dividend income. 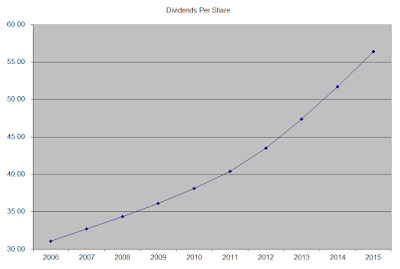 At the new dividend rate, the amount of annual dividend income increases by $20 to $172/year. If Medtronic had not raised the dividend, you would have had to buy 13 additional shares at a cost of $1,082 in order to bump up that amount of dividend income to $172. In other words, companies like Medtronic that regularly grow dividends, provide a lot of value to their long-term investors, because they can provide more in dividend income down the road with less money invested. Medtronic is expected to earn $4.66 per share in 2017 and $5.16 per share in 2017. The company closed the acquisition of Coviden in 2015. This move helped the company to move its base to Ireland. The top tax rate in Ireland at 12.50% is lower than the top US corporate marginal tax rate of 35%. This acquisition is expected to generate significant synergies for Medtronic, expand its global reach, diversify its product lines. Emerging markets could present solid opportunities for growth, as emerging markets in general could deliver double digit percentage increases in sales over the next decade. The growth in earnings per share will be achieved by introductions of new devices, cost containment initiatives as well as increase in foreign sales. Some cost containment initiatives that Medtronic had started a few years ago are starting to bear fruit. Future growth in earnings per share could also be aided through share buybacks. The medical equipment market is highly competitive and is characterized by short product life cycles. However, the scale of Medtronic’s operations, its continued investments in innovation as well as its diverse nature of procedures offset some of the risks. One risk that the company faces includes regulatory risk. The company has consistently repurchased stock over the past decade, and has reduced its share count from 1,217 million shares in 2006 to 1,014 million in 2014. As a result of the acquisition of Covidien, the number of shares have increased to $1.423 billion. Based on the company’s proclivity to share its excess free cash flow with shareholders in the form of dividends and share buybacks, I wouldn’t be surprised if the company ends up with roughly a billion shares outstanding a decade from now. Based on expected earnings for FY 2017, and new dividend payment, I calculate a dividend payout ratio of 36.90% for Medtronic. Medtronic has stated that it is committed to returning a minimum of 50 percent of its free cash flow to its shareholders through dividends and share repurchases. A lower payout is always a plus, since it leaves room for consistent dividend growth minimizing the impact of short-term fluctuations in earnings. Currently, Medtronic is attractively valued at 17.90 times earnings, has an adequately covered dividend and yields 2.10%.